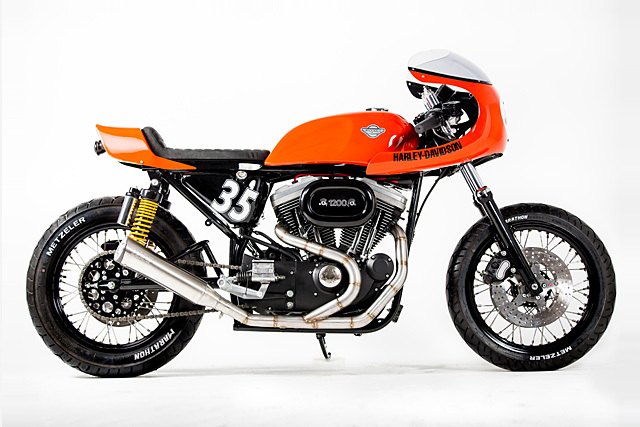 The custom bikes builders of Portugal are on fire of late and with the stakes constantly being raised, Rock Solid Motorcycles have shown up to the gun fight with a hand crafted weapon with its heart from the mean men of Milwaukee motorcycles, Harley Davidson! It’s an XL1200S Sportster but it could all have been very different; the customer initially arrived at the shop with a Yamaha Vmax asking what could be done to it. The Vmax never returned, but 2 months later the customer did with the only XL1200S on the market in Portugal at the time. Rock Solid could have turned out a nice tracker, scrambler or custom with the usual Harley bolt ons but this is a workshop of craftsman and only a total rebuild into a custom HD Racer would do. The most important part of the donor bike to the guys was that it came with a healthy engine as this was largely the only aspect of the bike that would remain untouched. The air-cooled, four-stroke, 45° V-Twin measuring 1199cc is not a horsepower monster and some would dismiss it by only reading the spec sheet. Around 60hp from an engine running 9.0:1 compression seems more like a commuter engine than one you’d want in a racer. 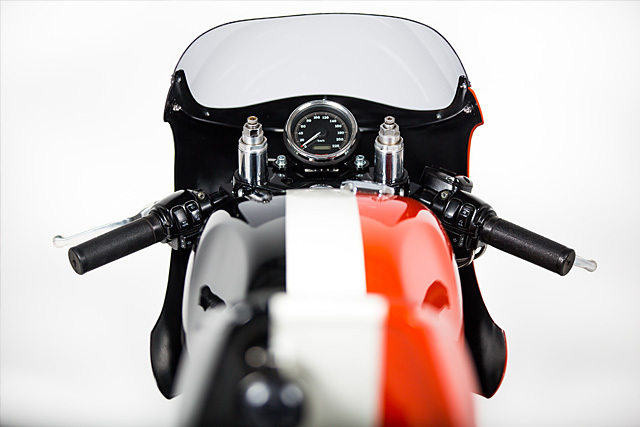 But when you consider it produces the same torque as a fellow twin of the era, the top end Ducati’s and does it at half the RPM you’ve got an engine that is like a freight train out of the turns. To boost the horsepower figure a Mikuni HSR carburettor was fitted that also improves the throttle response. While the exhaust adds even more ponies with a beautiful custom fabricated set of headers that flow into a Supertrapp muffler. 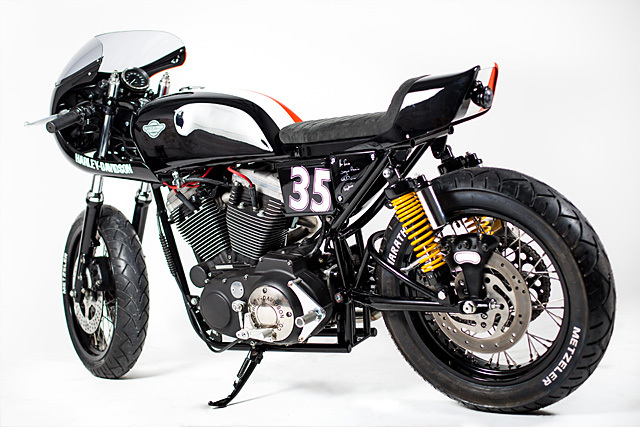 You might be looking at the frame and starting to think it’s been heavily modified as it bears little resemblance to the stock Sportster item and the swingarm appears to be Japanese. Well you’re almost right, the reason the frame and swingarm are so different is they are completely fabricated in-house and built entirely from scratch by the Rock Solid team. This further exemplifies why horsepower is not everything and quality craftsmanship should be far more highly valued. The standard front shocks remain, although lowered, and while small in diameter for a racer they were Showa items fitted by the factory. The rear end benefits from a twin shock setup like standard but with progressive rate springs mounted inside remote reservoir shocks. 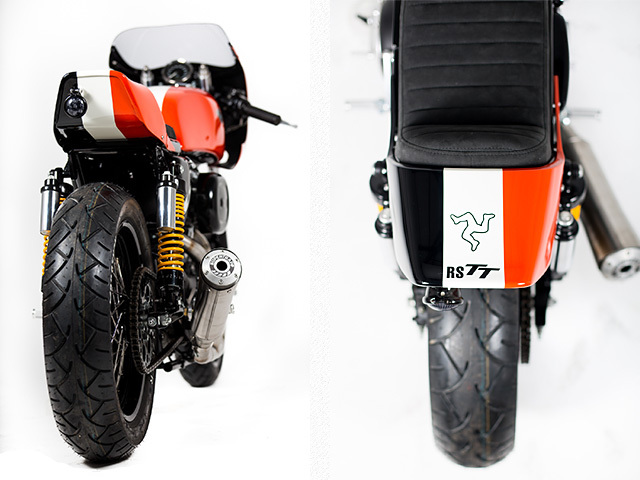 The custom frame opened up an array of options when it came to working out the right bodywork and fairings for the bike. Harley hasn’t built a faired factory racer for a long time and while dust bin fairings are cool and a great nod to the past they aren’t at all practical. 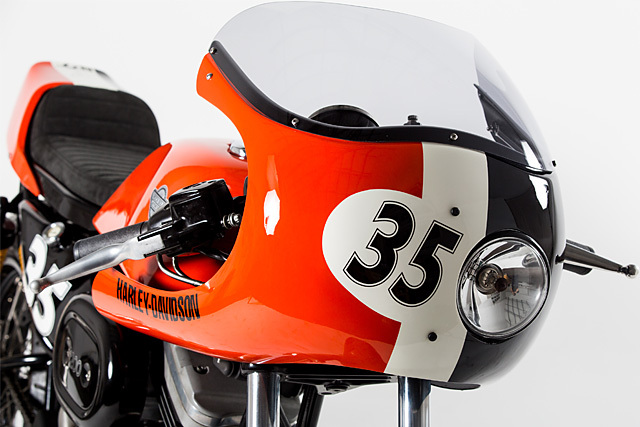 So to give a racer look the guys fitted up one of the great front fairings of all time, a 1970’s Ducati SS replica item with an offset front headlight. 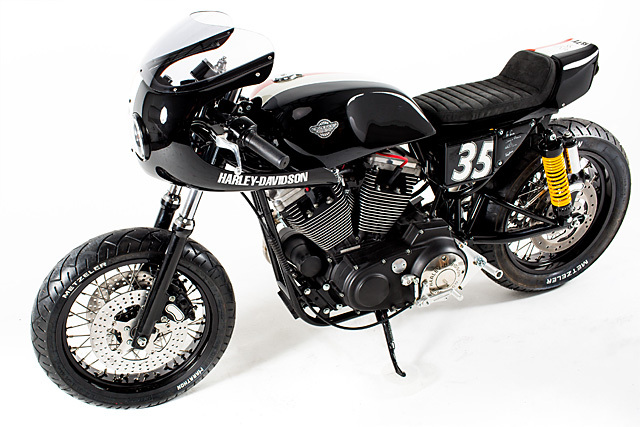 Both the tank and the seat started life as Yamaha items but have been heavily hand sculpted to achieve the desired look and work with the custom frame. 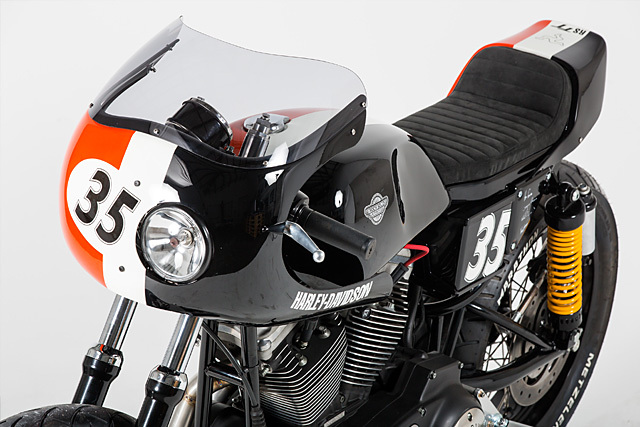 The whole lot is then beautifully painted in the classic Harley Davidson racing colours, with orange down the right side, black on the left and white that runs down the middle. 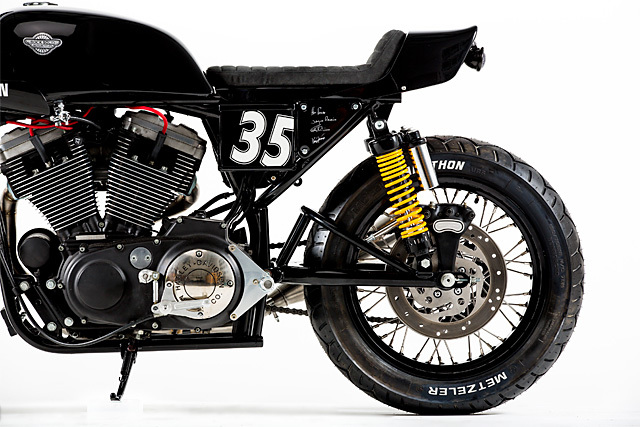 The HD racer sports the number 35 in all the right places and an homage to the famous Isle of Man TT with the “Ny tree cassyn”, the Three legs of Man, emblem cleverly laid out on the tail. Along with the headlight there are some other touches that make this racer a practical bike to ride. Harley switch blocks remain in place to avoid the need for small switches dotted all over the place and the Sportster factory speedo not only provides info for the track but keeps away the speeding fines on the road. 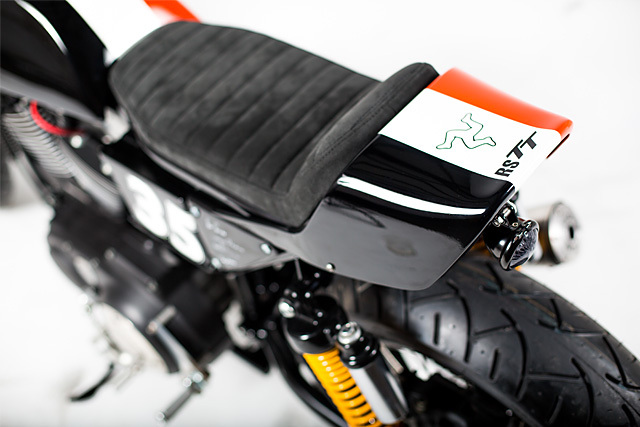 The seat is beautifully covered, slim enough for the racer look without being like a plank of wood and a small tail light hangs off the rear with a smoked lens to further hide its appearance. The rolling stock is a mixture of practical and cool, the spoked wheels were custom-made by performance legends Hagon in the UK. While the rubber comes from Guy Martin’s friends at Metzeler that combine both great handling with the right look and the ability to work well in all conditions. If one make of motorcycle suffers from being over modified by throwing an entire catalogue of aftermarket parts at their models it’s Harley Davidson. 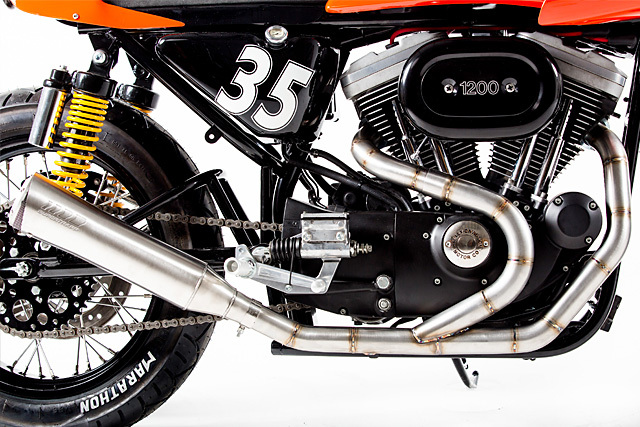 But everything on this Sportster was built for a purpose and what wasn’t needed was thrown away. The beautifully machined and handcrafted rearsets might be just a small part on the bike but they show exactly what Rock Solid Motorcycles is all about. A design rooted in authenticity and truth and a level of workmanship that refuses to compromise, this is truly a Harley Davidson you can say is one of a kind.